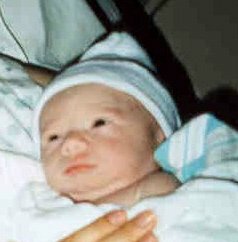 Joshua was born with Hypoplastic Left Heart Syndrome, a very serious heart defect. When he was 3 days old, he had open heart surgery to help him survive with the defect, but he lost his valiant fight 5 days later. If you'd like to read more about Joshua and his brief life, please visit his story here. We love and miss our son very, very much. He was so perfect in every way except for his tiny heart. We look forward to the day when we can all be reunited as a family.